Our youngest baby, N, was born at Christmas after a having quite a big gap as our boys are now 5, 7 and 8. Pushchairs have moved on a lot in that time, so I was a little overwhelmed with all of the options available – but the BabyStyle Hybrid Stroller has been a great choice for us, and I would totally recommend it as a flexible and versatile stroller that suits all eventualities. This was a deal breaker for me, as I really wanted the ease of interacting with my child. It has been proven that parent facing pushchairs do have an impact on speech development so it was really important to me to have that. The BabyStyle Hybrid has this option and it is really easy to switch the chair from parent facing into world facing. This is for the main stroller seat, so we’ve not used this yet but I have tried out moving the seat around and it couldn’t be easier. Quick and easy to fold. With four kids I don’t want to be faffing around when I’m trying to get the pushchair, everyone and all their various bags into the car so this was important. I used to struggle with some of the pushchairs we had in the past, but the fold with the Hybrid is amazingly easy and quick. To fold, you lift one handle and press and it just folds in a couple of seconds. It is very simple and fool-proof which is great. 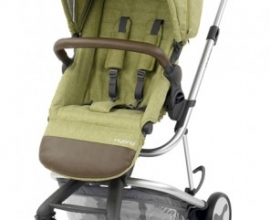 You will need to take the seat or carrycot off while folding, and then the frame itself folds down pretty small. Our car boot is quite big, but I wouldn’t foresee any issues fitting this into a smaller car boot, as we have fitted this pushchair in along with plenty of shopping, suitcases, and even furniture flat packs! There’s nothing worse than a pushchair that’s heavy and difficult to push! So obviously I was very keen to avoid that. The BabyStyle Hybrid is a really smooth ride, and I can easily push it with one hand while holding onto one of my other children’s hands. I had wondered whether it would be possible to get such a smooth ride without having air filled tyres on the pushchair, but it’s just as smooth as my previous off-roader type of buggies and there’s no risk of getting punctures which is a real plus. There are two options with the Hybrid stroller, to configure the stroller in “edge” or “city” formats, depending on the wheels fixed to the back axle. We have both sets of wheels, although we have been using the Hybrid Edge and haven’t experimented much with the City wheels yet. The city wheels give the pushchair a narrower width, which is a great option to have if you know you’ll be hopping on and off buses or going into busy shops on that particular day. The leather handle is a nice touch, which is comfy to push and also adds a bit of extra style to the pushchair. The handle bar height is very easy to adjust up and down for comfortable pushing too. I wanted something which would be versatile, so I could click the carseat onto the buggy frame when needed, and transfer in and out of the car. Car seat adapters are available for the Hybrid, which we purchased separately as they didn’t come with the main stroller. They are very easy to use, and we’ve been using it with Maxi Cosi Cabriofix. We’ve actually used this even more than I thought we would as my baby prefers being slightly upright, because she has slight reflux. The Hybrid carrycot is so lovely, it’s sturdy and well built, and looks really comfy so it’s a shame she hasn’t used it as much as I thought she would – but luckily the Hybrid is flexible and we’ve easily been able to use the stroller frame with the car seat for now, and I’ll be moving her into the main pushchair seat as soon as she’s ready. I’ll write another update post once we’ve been using it in that format for a while. The carrycot is a generous size, and is a standalone carry cot that can be detached from the stroller frame, rather than just being a lie flat mode on the main pushchair seat. I generally prefer a proper carrycot like this, as they are so much nicer for newborns. If your baby doesn’t like lying flat, you can try getting a reflux wedge for under the carrycot mattress, which is another alternative we tried as well as using the car seat adapters. Clicking the carrycot on and off the frame is very easy and can be done with one hand, in about 5 seconds. The carrycot is a separate purchase, so if you’re past that stage you can just buy the stroller on it’s own, or if you’re preparing for a new baby then be sure to buy them both separately. A reasonable sized shopping basket is a must for me, not only for shopping but more so to fit all of the kids bags and coats when we’re out and about. As any mums of multiple children will know, the bottom of the buggy is really valuable storage space on days out! The basket on the Hybrid is a good size and fits plenty in there. We also got the built in luggage for the basket, which is a changing bag that fits perfectly in the basket. This is something I hadn’t seen before and is a handy concept, allowing you to not carry a bulky changing bag. I don’t use it all the time, as you can definitely fit more in the basket when just using it as a basket, but depending how much you have to carry it can come into it’s own. Practicality and ease of use does come first for me, but of course I wanted a pushchair that’s nice to look at too! The Hybrid comes in a wide choice of colours and I love the purple-y “Wild Orchid” colour that we went for (also considered the Pistachio colour). 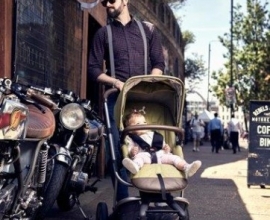 The leather detail on the handle bar and the carrycot are lovely, and make it look that bit more luxurious. I really enjoy pushing this stroller around, and am looking forward to trying out the main seat with N very soon, as she’s almost 5 months now. The BabyStyle Hybrid has been a fantastic pushchair for our early baby days, so I’m sure it will live up to my expectations as N grows into an older baby, and active toddler! We were sent the BabyStyle Hybrid Stroller in order to review, and purchased some accessories separately.